The curtain has come down on an incredible 11 days of Commonwealth Games sporting action in a glittering, star-filled closing ceremony at Glasgow's Hampden Park. England has topped the medal table of the Commonwealth Games with a total of 174 medals. Up to 8 million viewers tuned in to see Kylie and a host of other stars close Glasgow 2014, which has been dubbed the "best ever" Commonwealth Games. 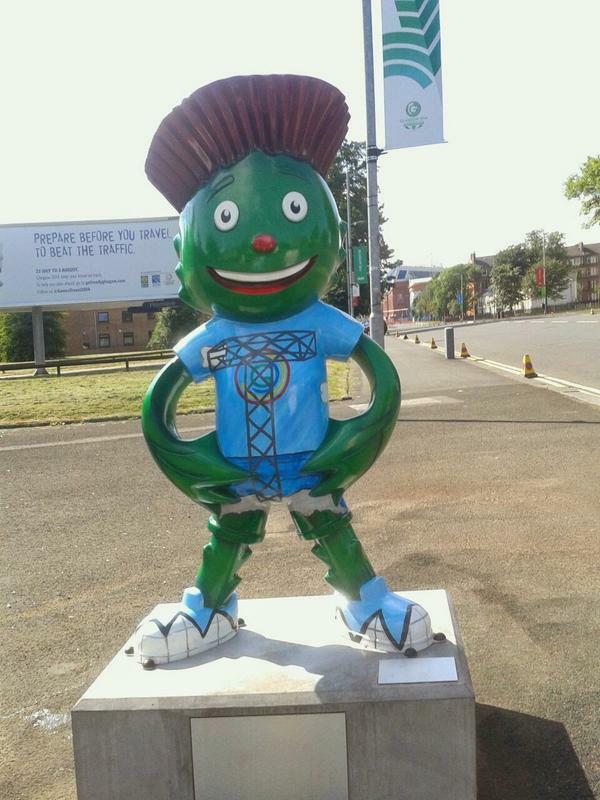 One of the Commonwealth Games Clyde mascot statues has been stolen from its plinth in Glasgow, Police Scotland tweeted. The popular figure went missing sometime between Wednesday afternoon and early this morning, they said on their Facebook page. Anyone with information on its whereabouts should contact Govan Police Office on 101 or Crimestoppers on 0800 555 111. Details can be given in confidence. Pop princess Kylie stole the show as she closed what has been dubbed the 'best ever' Commonwealth Games in Glasgow. Pop princess Kylie thanked Glasgow for an "amazing night" after closing the Commonwealth Games and said it was an "honour" to be there. Wow!!! 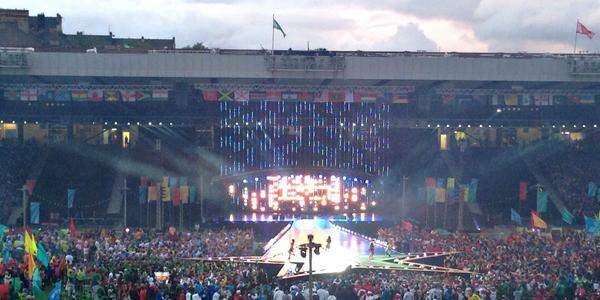 Thank you to #Glasgow2014 for an AMAZING night!!! It was an honour to be here with you! ?? Australian singer Kylie took to the stage in a spectacular finale of the Glasgow 2014 Commonwealth Games closing ceremony, delighting the packed Hampden stadium. Glasgow had "set the bar very high" for the city of Gold Coast in Australia who will host the 2018 Commonwealth Games, according to Queensland Queensland tourism minister Jann Stuckey. She said: "Thank you for welcoming us into your homes and your hearts. "Congratulations on delivering a Commonwealth Games that epitomised the spirit and passion of sport." Receiving the flag of the Commonwealth Games, Tom Tate, mayor of city of Gold Coast, said: "I am honoured to receive this flag on behalf of the people of City of Gold Coast, Australia." He added: "We accept this responsibility with great pride and in the spirit of the Commonwealth Games." Almost £5 million has been raised for the children's charity Unicef as a result of the Commonwealth Games. A live appeal by the actor James McAvoy and Olympian Chris Hoy during the opening ceremony got the ball rolling with almost £3.7 million donated. A further £1.2 million was raised through the partnership between Unicef, Glasgow 2014 and the Commonwealth Games Federation (CGF) before the Games, with the remainder coming from continued fundraising throughout 11 days of competition. The charity said the money will allow them to achieve the ambition of reaching every child in every Commonwealth country in a range of ways, including using sport and education in Malawi to engage with young people and help reduce HIV infection. Welsh rythmic gymnast Frankie Jones was presented with the David Dixon Award which recognises an outstanding athlete of the Commonwealth Games. Handing her the award Prince Imran, of Malaysia, president of the Commonwealth Games Federation said: "Her ongoing commitment to her sport alongside her quiet, inspirational character has encouraged many young girls to take up the sport." He went on to describe Glasgow 2014 as "the best Games ever", adding: "Glasgow - you were Pure, Dead Brilliant." Jones won six medals in Glasgow, claiming five silver and one gold in the ribbon routine which was her last ever performance before retirement. She was also the Welsh flag bearer at the opening ceremony. Athletes are nominated by their Commonwealth Games Association at the end of the final day of competition and the winner is selected by a panel of representatives from each of the six Commonwealth regions and the president. Prime Minister David Cameron has live tweeted from the Commonwealth Games closing ceremony. He said it was "hard to believe" it had finished. Tribute was paid to the 15,000 public sector volunteers known as the Clydesiders who helped with the Commonwealth Games. More than 50,000 people volunteered to help the 11 day event run smoothly, but less than a third were chosen to help. The Scottish singer Lulu has taken the stage at Hampden stadium in Glasgow, kicking off the Commonwealth Games Closing Ceremony. The Jamaican sprinter said the only negative at the Commonwealth Games was the weather, as he hailed the "brilliant" event in Glasgow.